If you are looking for a digital signage Calendar Widget that’s easy to use, and looks exactly like you want – don’t look any further, you found the right one. UCView launched a digital signage widget with an intuitive interface which makes its usage very simple and therefore suitable for most users. 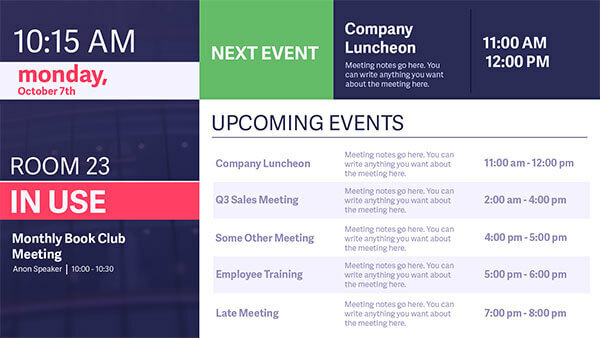 It is now very easy to use and apply any type of template for Room Calendar or events list displays, and its looks can be customized with a variety of HTML5 based templates. This newly created widget also allows integration with Google and Microsoft Office 365 Calendars, which is a must these days. It allows people and room calendars to be shown both in a zone on API supported SoC Displays and Players, and in full screen. 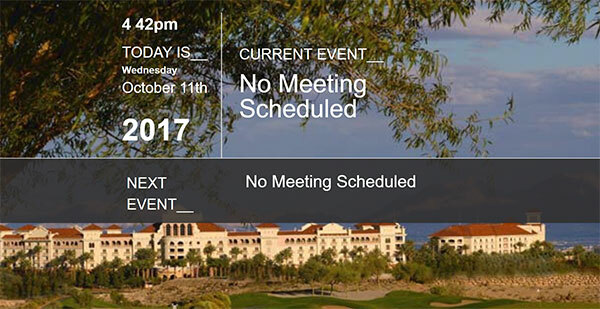 Every company can make use for this feature, especially if they want to display their calendars on wall displays in their receptions or outside of their offices. 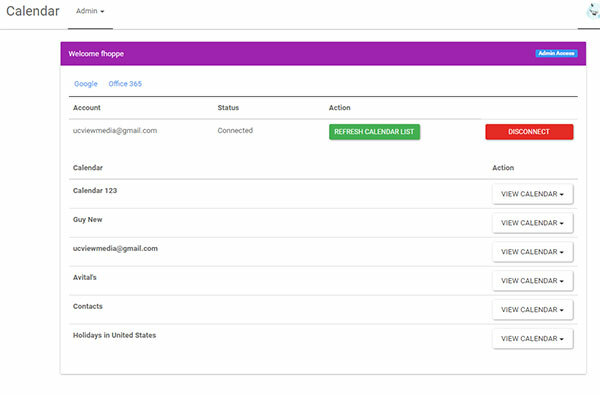 This app allows the user to choose the Google Calendar or the one from the Microsoft Office package, by simply connecting to their account and choosing the room/person and the template they want to use and publish it to their digital signage displays. Very useful for hotels, meeting rooms, etc. this app doesn’t only display the information needed, it also uses an integrated intelligence to change the Calendar Widget based on that information. For example, the background color of the widget will change according to the availability of the room it’s connected to. The users can explore all the different options and play with the app until they get exactly what they are looking for – and it is free! If you want to be up-to-date and show off the latest technology outbreaks, you should definitely use this amazing app. Not only does it allow the user to use both Google and Microsoft Office 356 information in the same feature, it has a trendy look and a great way of displaying all the necessary information. It will adapt to any changes that are made in the calendar and use its intuitive interface to match the needs of the company that is using it. Make sure to stand out among your competition with this cool way of integrating your calendars with a great digital signage widget that matches all your needs. It is colorful and easy to use, will show the important information that you need and allow you to choose from lots of templates that will match your business. Whether you are a manager of a hotel or a business owner of any kind, the UCView feature will give you the opportunity to ease your appointment-making procedure and let everyone know when and where events are happening. It is an absolute must-have and will help your team work as a well-oiled machine!